a-n remains committed to ensuring proper and fair payment to those working in the industry, both within the company and across its programmes and operations. a-n is committed to ensuring that its team of permanent staff (many of whom are working part-time and remotely, 65% of whom are artists), and its vibrant mix of freelance contributors, paid advisers and specialists, are treated fairly. We treat artists as professional colleagues in everything we do together. We involve artists in our governance (with three artists serving as Directors on our Board). We are grateful to and support our artist advisory group, Artists Council, drawn from and representative of our membership. We give artists due profile in our advocacy, marketing and communications activity, involving and profiling them where possible and as appropriate. a-n is the leading advocate and campaigner for good practice and transparency on artists’ pay across the sector. This is core to our mission and role as the leading professional membership and representative body for visual artists in the UK. We are committed to fair payment and terms for artists and arts freelancers and to advocating through all possible routes for adoption of fair payment and terms for artists across the visual arts sector. 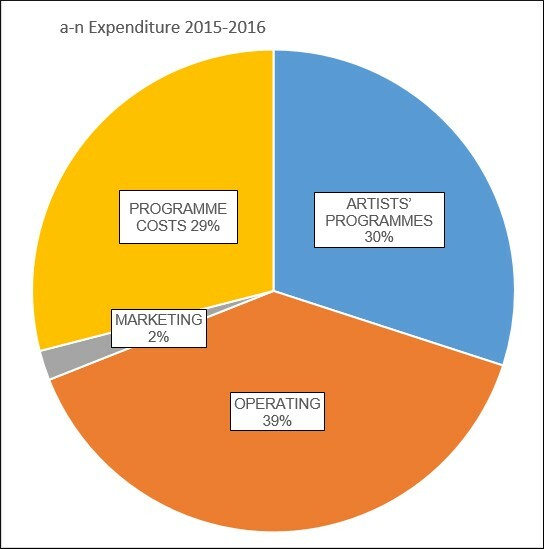 In 2015/16 a-n received £212,754 in revenue funding from Arts Council England (an essential addition to the £699,362 of self-generated income) which enabled us to keep our membership and professional services affordable for artists, to provide free information to emerging artists, and initiate research and development partnerships for the benefit of visual artists and the visual arts sector. 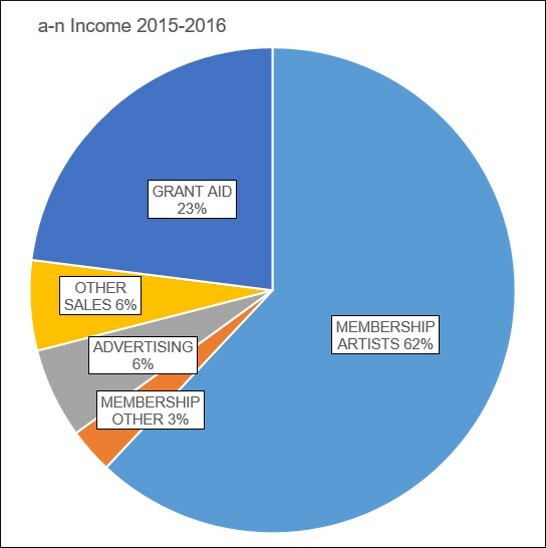 Artists continue to be our major stakeholder group and contributed £551,774 to our income in 2015/16. By prioritising and engaging artists in our business activity wherever possible we were able to return £310,464 (34%) of our income direct to artists through regular employment, freelance contracts and commissions, fees and bursaries in 2015/16. For each a-n artist membership sold, a-n subsidises the cost of the insurance premium included in the membership price, keeping membership and the professional insurance included, affordable for our primary stakeholders. Of the profit given back to members £69,331 was given back through artist bursaries in 2015/16, enabling 83 artists to undertake self-determined professional development and travel, providing vital support at a critical time. 65% of a-n’s staff team in 2015/16 were artists working for a-n part-time. The majority of a-n’s regular freelancers are also artists, or arts producers. a-n activity does not include presenting artists work to the public in exhibitions – if we were to engage in this activity we would follow our Exhibition Payment Guidance. From January 2017 our day rate for Artists Council advisers and artist Board members for attending meetings or representing a-n is £200 plus travel and expenses. These rates are stated in Artists Council adviser and Board member terms and conditions. Attendance rates for Artists Council and Board members are reviewed alongside any staff salary or freelance rate reviews, with any increase/decrease applied across all paid groups. Day rates for artists working with a-n to deliver freelance projects are negotiated individually either by applying our day rates, or to an agreed project fee, depending on the nature and length of work contracted. We confirm all artist freelance work with a contract (supplied digitally) that sets out the responsibilities and expectations of the agreement/contract. We provide professional development support, mentoring and networking opportunities for artists who are employed with us, or who work for us freelance, on a case by case basis and at the discretion of our senior team. We are committed to diversity and valuing artists whatever their background, gender, sexuality, education or faith. a-n commissions writing from artists and journalists to contribute to a-n News, Resources and Research, as well as to publications such as the annual a-n Degree Shows Guide. The current a-n word rate is 0.16p per word / £160 per 1,000 words. In 2015/16 we commissioned around 63,000 words. Where writer attendance at an event is required to research a piece, or additional research is required, a payment for the writer’s time is negotiated. In 2015/16 we provided professional development for 5 artists through our Writer Development Programme, a specially designed intensive course delivered with industry experts. Some of these writers are now regularly commissioned by a-n, or are working freelance for other sector magazines. Our company payment policy is reviewed annually, with salary and freelance pay rates reviewed at the start of each business planning phase and in line with a-n’s Equality and Diversity Action Plan. All staff are properly remunerated and suitably contracted (including the provision of an employee pension from July 2017) as regards the value they bring through contributions to our operations, programmes and consultations. Salaries are benchmarked as appropriate. A training budget for professional development opportunities to employees and Artists Council advisers is agreed as part of each annual budget. A review of a-n’s payments to writers will be undertaken with appropriate and affordable increments budgeted for as part of the company’s 2018-2021 business planning.